Buffalo chicken mac n cheese and loaded carne asada nachos! PHOENIX — Spring Training is back in Arizona! Whether you're cheering for one of the 15 teams that play in the Cactus League, or all of them, or just want to enjoy a hot dog, a cold beer and a bag of Cracker Jack, here is a quick and easy-to-read guide to each of the Valley's 10 baseball stadiums -- especially where they're at and how to get to them. The teams that play in the Cactus League are: Arizona Diamondbacks, Chicago Cubs, Chicago White Sox, Cincinnati Reds, Cleveland Indians, Colorado Rockies, Kansas City Royals, Los Angeles Angels, Los Angeles Dodgers, Milwaukee Brewers, Oakland Athletics, San Diego Padres, San Francisco Giants, Seattle Mariners, and Texas Rangers. More than 100 games are scheduled between Feb. 21 - March 26, 2019. You can view the full Cactus League schedule, here . 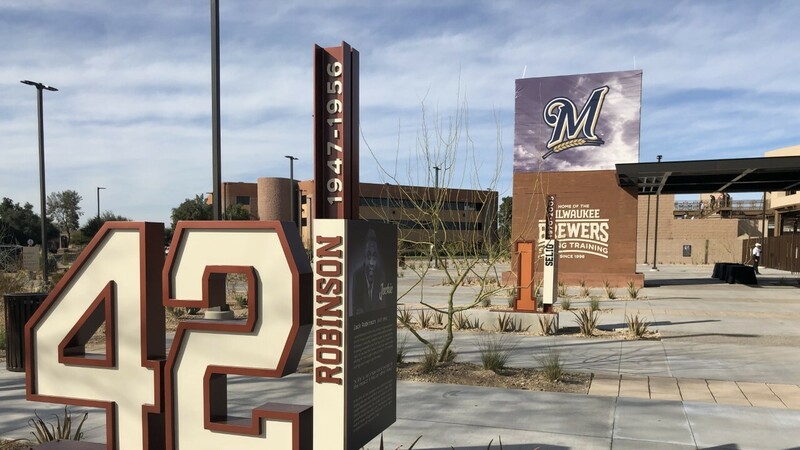 The stadium where the Milwaukee Brewers play has undergone the biggest transformation ahead of this year's Spring Training season -- $60+ milion worth -- to include an updated entrance, a new team shop, and a name change: American Family Fields of Phoenix. Fans arriving to the stadium will notice a new main entrance, clubhouse building and team shop. A new scoreboard replaced the old one in left field. The concourses along the First and Third baselines were widened, the bathrooms were updated, and concession stands were renovated. The bench-style seats were replaced with stadium seating. The 7,000-seat stadium is located at 3600 N. 51st Avenue in Phoenix. Tickets can be purchased at the stadium box office, online or via phone at 1-800-933-7890. They range from $8-$34. Parking is $5-$10 cash-only. More parking info and where ride-share pick-up and drop-off is . What's new this year? 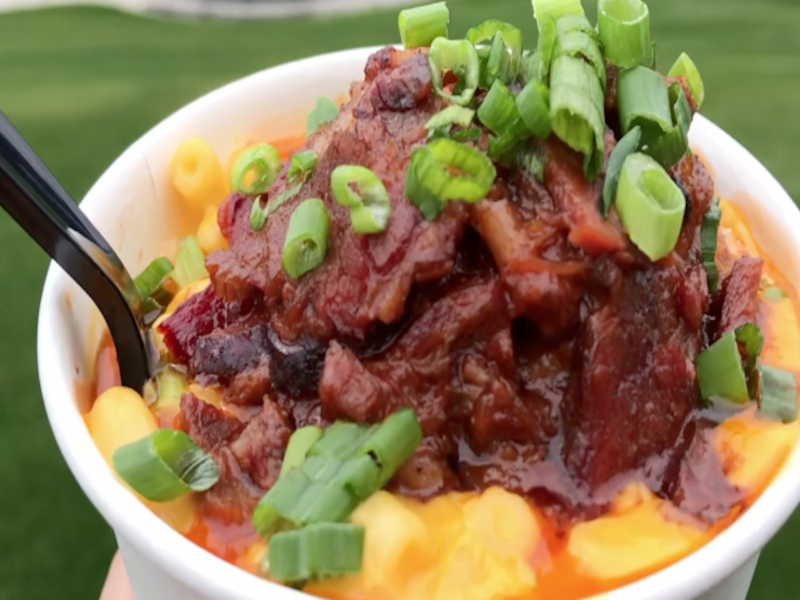 Besides the renovations, the concession stands will have some new items: Buffalo chicken nachos; Wisconsin fried cheese curds; BBQ mac and cheese; Bratcho, fresh-fried kettle chips with nacho cheese and bratwurst slices; and the County Stadium-style footlong brat, which is a footlong bratwurst served with hot Sauerkraut and a secret sauce. The Chicago White Sox and the Los Angeles Dodgers play their Spring Training home games at Camelback Ranch - Glendale. Single-game tickets range between $10 - $69 depending on the game and the opponent. Dodgers tickets can be bought, here. White Sox tickets can be bought, here. Parking is free. The address is 10701 W. Camelback Road, Phoenix AZ 85037. This year, the stadium will have free W-Fi for fans. Last season, they added more shaded areas and a video board, according to Scott Carter, director of marketing and corporate partnerships for the stadium. The Cleveland Indians and Cincinnati Reds play their Spring Training home games at Goodyear Ballpark, which will celebrate 10 years in 2019. The 9,500-seat stadium first opened in February 2009. The address is 1933 S. Ballpark Way, Goodyear, AZ 85338. Spring Training tickets range from $8-$31 per game. Parking is $5 cash-only. Cleveland Indian tickets can be bought, here, and Cincinnati Red tickets can be bought, here. Both teams will also offer special "fan experience" packages where fans can either participate in an on-field workout or clinic, meet a couple players, and watch batting practice. Those packages range from $80-$130 per person. To celebrate the 10-year milestone, the stadium will unveil a new mascot on Opening Day, Feb. 23. Starting on March 2, the first 50 kids, ages 3-12, to get a wristband from Guest Services will be able to participate in a pregame on-field activity (available at Saturday games only). What's new this year? The stadium will have new snacks and treats for fans, including a Hatch green-chile burger, mini corn dogs, garlic fries, Funnel Cake fries, Philly Cheesesteak dog, and Hatch green chili-infused chicken sausage. They also added a shaded bar, called Craft Beer Corner, along the Third base line that will have beers from Arizona and Ohio. HoHoKam Stadium is the Spring Training home of the Oakland Athletics. The address is 1235 N. Center Street in Mesa. The current stadium opened in February 1997. It has 7,500 seats and room for another 2,500 people on the lawn, according to its website . The Athletics began playing at the stadium in spring 2015, after a year-long renovation of the stadium after the Cubs moved to Sloan Park. Single-game tickets are $10 - $35, depending on the game and the opponent. Tickets can be purchased, here, at the box office (near Gate D), or over the phone at 877-493-2255. Parking is $5 and $10 for RVs and oversized vehicles. The San Diego Padres and Seattle Mariners each play their home games at the Peoria Sports Complex, which is northwest of Phoenix. The baseball complex is located at 16101 N. 83rd Avenue in Peoria within the city's "P83" entertainment district. Tickets are $7-$30 per game. Padres tickets can be purchased, here. Mariners tickets can be bought, here. What's new this year? Fans can make their own burger at "Burgers on Deck" burger bar. Scottsdale Stadium is the Spring Training home of the San Francisco Giants. The stadium’s address is 7408 E. Osborn Road in Scottsdale. It can hold roughly 12,000 fans. Tickets start at $12 and can be purchased, here . Paid parking is available at parking structures near the stadium. The city will also have a free trolley that will pick up and drop off people at the stadium. The shuttle begins 90 minutes before each game and ends 30 minutes after. You can catch the shuttle at the Loloma Station, at Fashion Square Mall near Nordstrom, or along Fifth Avenue, according to the website. View trolley map. Sloan Park is one of the newer Spring Training facilities in the Valley. It opened in 2014. The ballpark is located at 2330 W. Rio Salado Parkway in Mesa, not far from the Tempe Marketplace shopping center. Tickets vary between $14-$94 depending on whether fans sit on the lawn or reserve a seat, as well as who the Cubs are playing. Tickets can be purchased online, at the Sloan Park ticket office, or over the phone at 800-843-2827. The stadium features a Sloan-ified version of the iconic red "Wrigley Field" sign. Take a photo tour of Sloan Park . Parking $5 for general parking, $10 for reserved parking, and $14 for buses and RVs. Here is the signature item for @Royals and @Rangers Spring Training games this year: the "Double Dog Dare You." 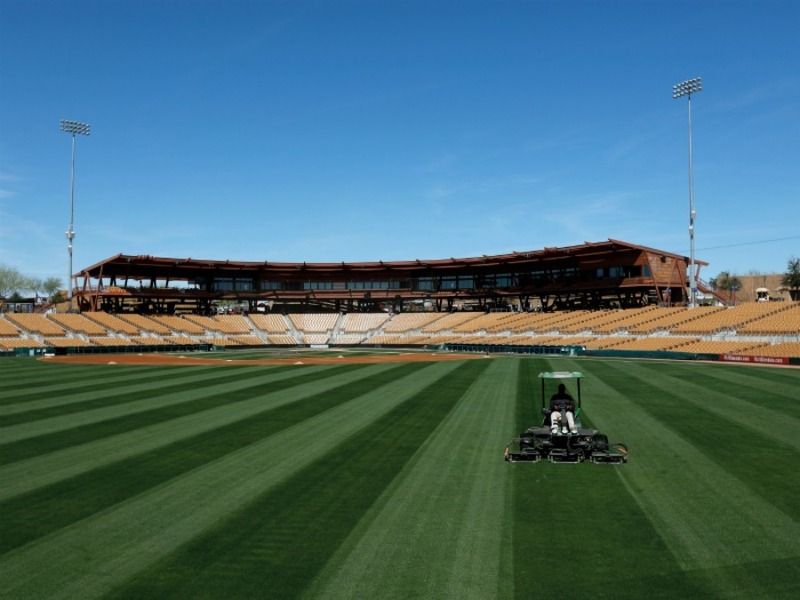 The Texas Rangers and Kansas City Royals each play at Surprise Stadium during Spring Training. The address is 15930 N. Bullard Ave. Surprise AZ, 85374. The stadium opened in December 2002. Single-game tickets range from $8-$45. Royals tickets can be bought, here. Rangers tickets can be bought, here. There is no charge for parking. What's new this year? This season's signature item is the "Double Dog Dare You" hot dog-sandwich. Admittedly, I'm not really sure if it's a hot dog or a sandwich, or both. It features two 11-inch hot dogs stuffed inside a foot-long loaf of bread and is topped with bacon, chili, nacho cheese, shredded cheese, diced onions, jalapeños, and tortilla strips. Fans can also upgrade their tickets or purchase tickets to the " Legends Deck ," which includes a meal from local restaurants, a drink voucher, access to flat-screen TVs and a private bar. The Arizona Diamondbacks and the Colorado Rockies both play at Salt River Fields at Talking Stick, part of the Salt River Pima-Maricopa Indian Community. The entertainment complex is located at 7555 N. Pima Road Scottsdale, AZ 85258. Single-game tickets start at $15. Tickets D-backs tickets can be bought, here. Rockies tickets can be purchased, here. What's new this year? There will be two signature food items this year: the PB&J burger (Cattle Co. stand) a half-pound burger topped with peanut butter, cheddar cheese, bacon, sauteed jalapenos and sweet chili jam; and Pork Carnitas tacos (Sonoran BBQ stand), Adobo shredded Pork, lime scented cabbage, pickled red onions, and cilantro crema. Chick-Fil-A will have a tent along the main concourse. Dutch Bros. will be ce. They've expanded the Absolut bar along the Home Plate concourse and opened a bar with craft beer near section 210. What's with all the construction? Fans to Salt River Fields will likely notice two construction projects in the area. Great Wolf Lodge is building a 350-room hotel and indoor water park next to Salt River Fields. That project is expected to open later this year. Related: Behind-the-scenes photo tour of Medieval Times . Just up the street, Medieval Times is in the process of building its castle to host its dinner-theater show, which is expected to open this summer. Tempe Diablo Stadium is the Spring Training home of the Los Angeles Angels. The address is 2200 W. Alameda Drive in Tempe. Tickets range from $15-$100. Tickets can be purchased, here. Parking is $5 per vehicle and $25 per RV.